In addition to Paris, Berlin and Frankfurt, the fully electric light-duty trucks with an output of 129 kilowatts and a payload of up to four tons are also on the road in other European cities such as London, Amsterdam, and Lisbon. Logistics service provider DB Schenker and Fuso, a Daimler Trucks brand, are expanding their partnership to bring more fully electric cabover trucks into European cities to support last-mile deliveries. 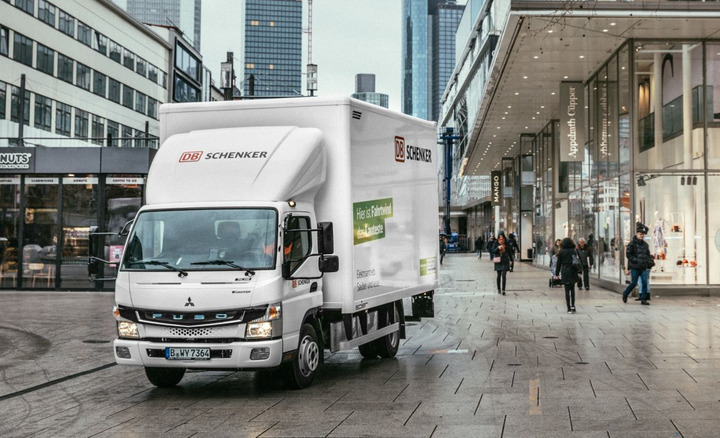 DB Schenker took on four additional Fuso eCanter trucks in March for urban short-radius distribution in Paris, Frankfurt, and the Stuttgart region. DB Schenker has already been using an eCanter in Berlin since last year and is testing the use of the vehicles in mixed fleets. DB Schenker is now in talks with Fuso about further eCanter vehicles for additional European markets. "We need to bring goods into inner cities in a more sustainable manner and irrespective of vehicle bans," said Tristan Keusgen, head of European fleet management at DB Schenker. "Our experience with the Fuso eCanter up until now has been valuable. It is perfectly suited to serving our customers in urban areas such as Paris or Frankfurt." DB Schenker is planning to use two eCanter trucks in France; they will be making around four trips a day with 10 to 12 stops in the Paris region. Two eCanter are also on the road in Frankfurt and the Stuttgart region, delivering to customers in inner-city areas almost silently and with zero emissions. Since 2018 DB Schenker has been testing a Fuso eCanter as a series-production electric vehicle in Berlin under real operating conditions. The vehicle transports packaged goods in the inner city. Experience with the vehicle in Berlin has been positive with drivers praising the pulling power and agility of the electric drive and the peace in the cockpit, according to the company. In addition to Paris, Berlin, and Frankfurt, the fully electric light-duty trucks with an output of 129 kilowatts and a payload of up to four tons are also on the road in other important European cities such as London, Amsterdam, and Lisbon as well as in New York and Tokyo. At present a total of more than 100 eCanter trucks are being used in delivery operations worldwide and have completed more than 300,000 km electrically. The 7.5-ton vehicles boast a range of at least 100 kilometers and are thus able to cover the requirements of customers in inner-city short-radius distribution without problem. The vehicles are charged simply overnight either with alternating current or direct current chargers depending on availability. Charging can be reduced to around 90 minutes if a high-speed charger is used.